We started out with the Kid Basix Safe Sippy that starts as sippy and transform into a straw attachment. 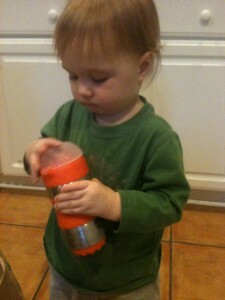 We use it almost daily as it is the only cup I have for him that is both spill-proof and stainless steel! The Safe Sporter is a bit difficult for him to use on his own yet, as it is recommended for age 4+ but it is great to stick in the diaper bag. I like to keep my drinks cold and this one definitely helps with that! It comes in six bright colors! BUY: at kid-basix.com or at their many retailers at $14.95 for the 12oz. Coupon Code Alert: KB Sporter for 20% off! WIN the Kid Basix Safe Sporter in color of choice!